Home / Conventions / 2015 Pittsburgh / Barbershoppers bring harmony to Pittsburgh | TribLIVEBecome A Member! 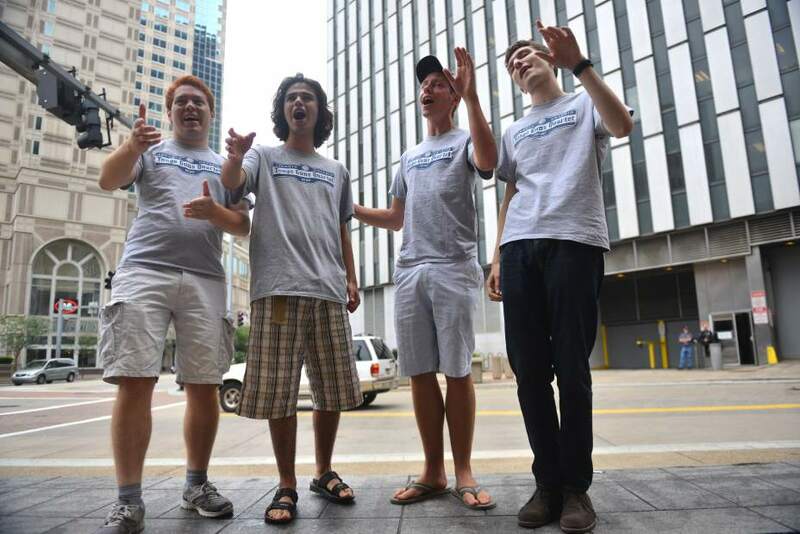 The Yonge Guns Quartet from Toronto, Ontario, Canada (from left) Chris Tanaka-Mann, Reuven Grajner, Greg Mallett and Jonah Lazar perform ‘If My Friends Could See Me Now/Hey Look Me Over’ medley Tuesday June 30, 2015 on a park bench along Liberty Avenue in Downtown Pittsburgh. There’s harmony in Pittsburgh this week. ← New BHS website launched!